The Gooseberry Collection was inspired by the delicate beauty found in naturally decaying foliage. With the gooseberry in particular, the lace-like veining that remains creates other-worldly forms. "Once a year there is a harvest of cape gooseberries in North India and the streets are full of push carts stacked high with bundles of them. Although I love the taste of the fruit, what I really love about the fruit is the casing that is often called a chinese lantern." 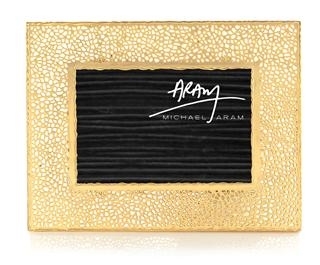 Forest Leaf Frame 5x7 Botanical Leaf Frame 5x7 Black Orchid Frame 8x10 Michael Aram Heart Frame, 8" x 10"